Gerry Archibald’s lifelong love affair with basketball could be traced back to his father Lyman, who had been a member of the original team organized by James Naismith at the Springfield YMCA in 1891. Gerry’s father was active in the promotion of basketball in various parts of the country for 25 years. Archibald began playing independent and semi professional basketball in 1925 when he was only 17 years old. Starting as a teenager he showed a remarkable ability to organize, and manage basketball teams in his hometown of Warren, Ohio . Over the years, the sponsors and players changed, but Archibald remained in charge with a disarmingly genial manner. His teams gradually traveled farther afield and raised the quality of opponents playing in Warren. By the early thirties, the Warren Transits were hosting elite traveling teams such as the Original Celtics and the New York Renaissance at Beaty High School court. In 1933-34, HyVis Oil became the sponsor of the team which helped to further upgrade the roster. In 1936, Archibald engineered entry into the Midwest Basketball Conference where they posted very respectable 8-6 record against some of the best pro teams in the country. Warren became a charter member of the National Basketball League in the 1937-38 season. 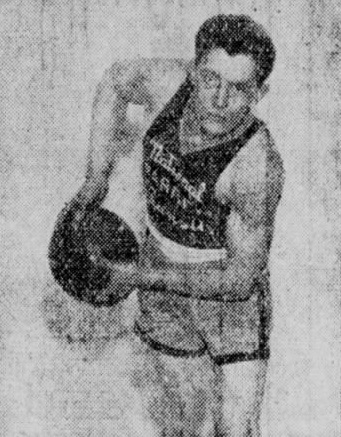 The following season, Archibald pulled a coup by signing Buddy Jeannette and Bill Laughton who together had averaged 26 points a game at Washington and Jefferson College. Jeannette was at the starting point of a career that would end in the Basketball Hall of Fame. Archibald had put together the best team of his career, but his problems were multiplying rapidly. Mounting expenses forced Archibald to agree to have his team play in the New York-Pennsylvania League representing Elmira, New York at the same time they were competing in the NBL. In early February of 1939, Archibald was forced moved his NBL team to Cleveland where he had garnered the sponsorship of the White Horse Motor Company. The following season (1939-40) Archibald joined forces with Jacob Mizer a Detroit businessman and moved the team to the Michigan city. At the end of the season, he sold his shares in the team ending his remarkable basketball odyssey. Gerald Bruce Archibald Born: Aug 22, 1908 Died: Nov 25, 1990 Hometown: Warren, Pa.